After six days in China, my knowledge of Mandarin remains minuscule, to say the least. I've learned a few Chinese characters, mostly from highway signs. I can recognize the character for "tree" or "wood" - because it looks like a tree, and I can spot the character for "mouth" - - because it looks like a mouth. I can usually remember that the character that reminds me of the Greek letter "phi" means "middle", or "China." And I know that the word for "pine" (pronounced "song") has a lovely whispery sound to it. 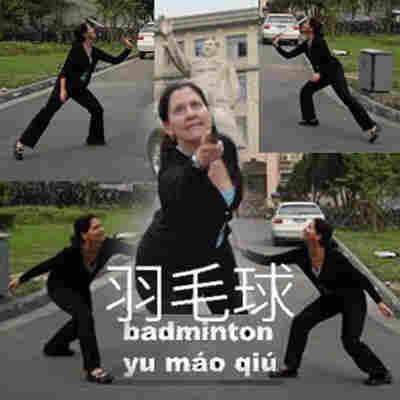 Now I can add to my entirely random list of Chinese words the one for badminton! As we were leaving an interview with a professor today at Sichuan University, we happened upon two students playing badminton in front of an imposing statue of Chairman Mao. The next thing we knew, we were playing, too.